Some sufferers from psoriasis go on to develop psoriatic arthritis. It is not clear why a minority of people with psoriasis get psoriatic arthritis, while the majority do not. It’s believed that an infection or an injury to a joint can act as a trigger in some people. This disease can occur without the usual skin spots of psoriasis, although this is rare. The disease tends to come and go, being subject to remission and flare-ups. 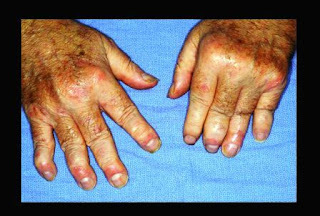 In psoriatic arthritis a variety of joints are attacked, most commonly the fingers, toes, elbows, knees and spine. The main symptoms are swelling and stiffness, and the disease can become very painful. Inflammation of the spine can result in a stiff back or neck, or sometimes in a pain in the buttocks. The disease is often associated with pitting of the nails. Of course, people with psoriasis can also get rheumatoid arthritis or osteoarthritis, and may wrongly assume they have psoriatic arthritis. A rheumatologist should be consulted to confirm which type of arthritis is present. NSAIDS: NSAIDS (non-steroidal anti-inflammatory drugs) are often used to treat psoriatic arthritis. These include ibuprofen, diclofenac and naproxen, all sold under a wide variety of tradenames. Some somewhat newer NSAIDS are Cox-2 inhibitors, such as etoricoxib (trade name Arcoxia) and celecoxib (trade name Celebrex). NSAIDS are usually effective, but can lead to increased risk of cardiovascular problems, such as heart attacks or strokes. Naproxen is considered the safest in this regard. Indigestion and stomach problems are possible side-effects of the older NSAIDS, such as ibuprofen and naproxen. NSAIDS can worsen the symptoms of psoriasis in some sufferers, so are not suitable for everybody. Steroids: Oral steroids are sometimes used for the treatment of psoriatic arthritis. Oral prednisolone (several trade names, including Prednesol) or oral betamethasone tablets (trade name Betnesol) are sometimes used. Although they may relieve the symptoms, many side-effects can occur, so they are only suitable for short-term use. The symptoms can return with renewed vigour once treatment has ceased (rebound). Steroids can also be injected directly into an affected joint, which often gives immediate relief from pain. DMARDS: Disease-modifying anti-rheumatic drugs, or DMARDS, are often used to treat psoriatic arthritis. They are more suitable for long-term use than steroids, but take longer to give relief. You may find that they seem to do nothing at first, but they should gradually improve your symptoms if you persevere. Leflunomide (trade names Arava and Arabloc) and sulfasalazine (trade names include Salazopyrin and Sulazine) are typically used. Methotrexate (trade name Maxtrex), which is also used for ordinary psoriasis, is another possibility. Although these drugs are more suitable for long-term use, they can still give side-effects, such as digestive problems, headaches, and dizziness. None of these drugs should be taken during pregnancy. Methotrexate can lead to miscarriage and birth defects, and can also damage sperm, so both men and women on this drug should use reliable contraception. Biological treatments for psoriatic arthritis: Various biological agents can be injected to treat psoriatic arthritis. All these medications are expensive, so are only used when the normal treatments have proven to be ineffective. Golimumab, adalimumab, certolizumab, etanercept and infliximab are examples of these treatments. 0 Response to "Psoriatic Arthritis & Treatment"